Description: Rolling Stone 500 Greatest Albums of All Time - Rated 266/500! Mastered by Kevin Gray and Robert Pincus from the Original Master Tapes for this 2013 Edition 24K Gold CD! Includes 4 Bonus Tracks of Original Demos! 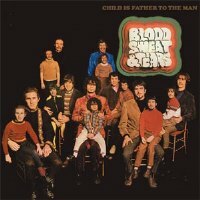 Blood, Sweat and tears began as an Al Kooper project in 1968, as a part of a move toward "bigger" rock sounds. The album introduced the idea of the big band to rock and roll and paved the way for such groups as Chicago. Child, the only album made under Kooper's direction, is important not only because its jazz and art-song aspects expanded the scope of the rock for both audience and musicians, but also because it was one of the most perfectly listenable pop albums of its era. The Al Kooper-helmed Blood, Sweat and Tears created the 60's big horn, big city rock sound, earning this inventive, soulful record a place on Rolling Stone magazine's 500 Greatest Albums list. Mastered by Kevin Gray from meticulously captured hi resolution digital files transferred from the original master tapes, and including four bonus tracks (original demos, mono), this is as close as you'll ever get to Kooper and Co's singular vision.